The latest in foodie novelties are these little spherical gelatinous “pearls” filled with extra virgin olive oil or with balsamic vinegar of Modena. The idea is to sprinkle them over salads and other dishes so that when you bite into them you get a sudden burst of flavour. There is no doubt that they are great fun but I am not sure that they will stand the test of time. We shall see. In the meantime here are some recipes using pearls from various different producers. Lime juice from two limes. Season white crab meat with sea salt, ¼ of the lime juice, ¼ of lime zest and a dash Orodeal Extra Virgin Olive Oil to taste. Mix and reserve. Season brown crab meat with sea salt, black pepper, ¼ of lime juice, a pinch of dried ground chilies, one smashed garlic clove and a dash of Orodeal Extra Virgin Olive Oil. Mix and reserve. Put a deep pan on a high heat and add three tablespoons of Orodeal Extra Virgin Olive Oil. Once the oil heats up, add a crushed garlic clove and a bay leaf then fry for 1 minute. Add the beluga lentils and a pinch of sea salt. Fry for three minutes, stirring frequently, then add boiling water until the lentils are covered by 1cm. Lower heat to minimum, cover the pot with a lid and cook for 20 minutes. The lentils should be all dente but cooked. Take lentils out of the pan, place in bowl to cool. Once the lentils are cold, season with sea salt, chopped chives, chopped coriander, diced avocado, diced & peeled tomato, lime, remainder of the lime zest and a dash of Orodeal Extra Virgin Olive Oil. In a mortar smash a peeled garlic clove with a pinch of sea salt until it becomes a paste. Make the aioli with the yolks, garlic paste, sea salt and Orodeal Extra Virgin Olive Oil. 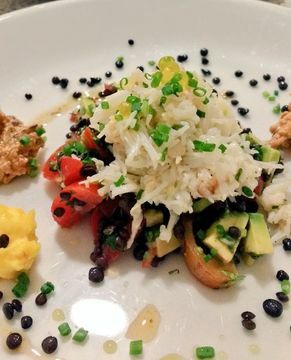 To serve, place the lentils, avocado and tomato mix on a plate, place the white crab mix on top, add a teaspoon or two (approx. 5-10g) of the 1916 Olive Oil Pearls on top of the crab. On the side place a teaspoon or two of the brown crab meat and one teaspoon of aioli. Drizzle Orodeal Extra Virgin Olive Oil on top and around the salad. Serve with toasted sourdough and some green seasonal leaves. This simple but effective first course recipe comes from the producer of Oro Bailen extra virgin olive oil and uses their Arbequina olive oil pearls. Cut the tuna into small beat cubes and toss in the lemon juice. Mix with sea salt and place on an attractive plate or some interesting leaves. Dot with slices of radish and finely chopped chives. Drizzle with a little Oro Bailen extra virgin olive oil and finish with the olive oil pearls. 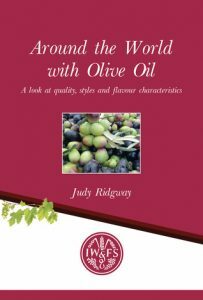 This is a very quick version of a classic Italian salad comes from Belazu who sell an excellent early harvest Arbequina olive oil pressed from olives grown in northern Spain. 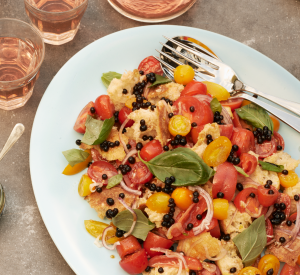 The salad also features balsamic vinegar pearls. 400g assorted seasonal tomatoes (cherry tomatoes on the vine, green, orange or yellow tomatoes), chopped. Cut the bread into large chunks, then tear these into bite sizes, place in a serving bowl and drizzle with extra virgin olive oil. Add the chopped tomatoes, basil and red onion to the bread and season with salt flakes. Using your hands, mix the ingredients thoroughly ensuring the bread is covered with juice and extra virgin olive oil. Finish with black pepper and Balsamic pearls. 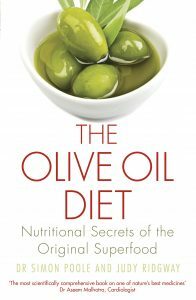 For more recipes using extra virgin olive oil see Remarkable Recipes from the people who really know about extra virgin olive oil – the producers and The Olive Oil Diet.